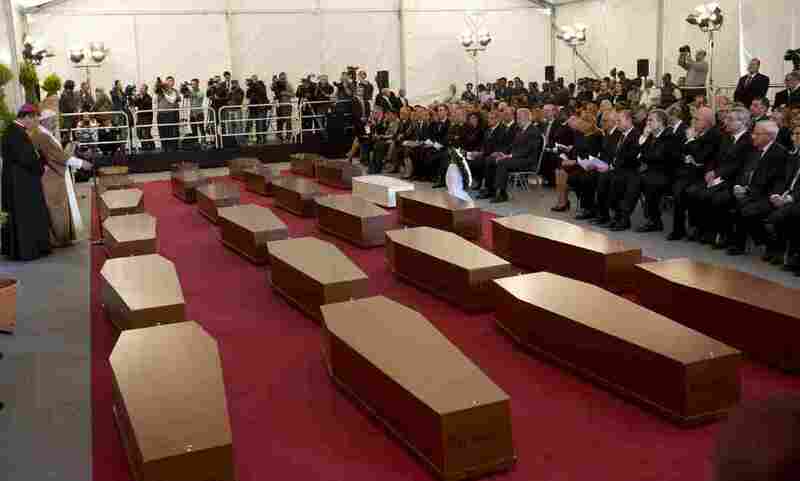 There's A Sad Reason 'Migrants,' Not 'Immigrants,' Is The Word Being Used : The Two-Way Hundreds of people died this month when an overloaded ship sank in the Mediterranean Sea. They were on the move, but never reached their destinations. Near Valletta, Malta, on Thursday there was a funeral service for 24 of the hundreds of migrants who died earlier in the week when the ship they were on capsized and sank. There's a case to be made that the word "refugees" also applies. A refugee, according to Webster's New World College Dictionary, is "a person who flees from home or country to seek refuge elsewhere, as in a time of war or of political or religious persecution." Among those on the ship that sank, and the other vessels sailing from Northern Africa to Southern Europe, were people fleeing the war in Syria and persecution in places such as Somalia. It's fair to say that almost anyone who takes the risks associated with these trips is likely to be desperate and is seeking refuge. But to label all those aboard the ships as refugees may not be accurate. The word migrants, however, fits. Webster's says that to migrate is to "move from one place to another." A migrant, in turn, is "a person, bird, or animal that migrates." The word also conveys what is happening: Large numbers of people are on the move, looking for homes. They are migrating across hundreds or thousands of miles. The word "immigrants" is not being used in most media reports. There's a sad reason. To immigrate, Webster's notes, is to "come into a new country, region or environment ... esp. in order to settle there." Tragically, the hundreds who died this month did not reach their destinations. Note: We know there are also legal definitions of the words migrant and refugee. The International Organization for Migration has posted its glossary here. This post and Saturday's "Word Matters" conversation, however, are about the way news outlets use the words, not international agencies.